Pecan Pie Cobbler brings together the Ooey Gooey filling of pecan pie with the decadent cake-like topping of your favorite cobbler! It’s to die for delish! This Pecan Pie Cobbler transforms traditional pecan pie into a heavenly cobbler, and there’s noting wrong with that! Move over Pecan Pie there’s a new kid in town! 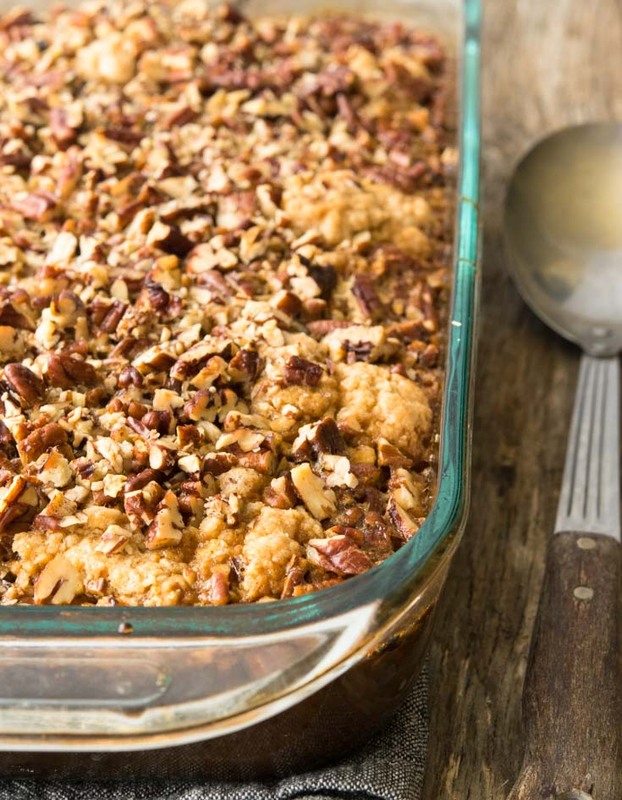 This Pecan Pie Cobbler recipe packs pecans in every moist, delicious bite. 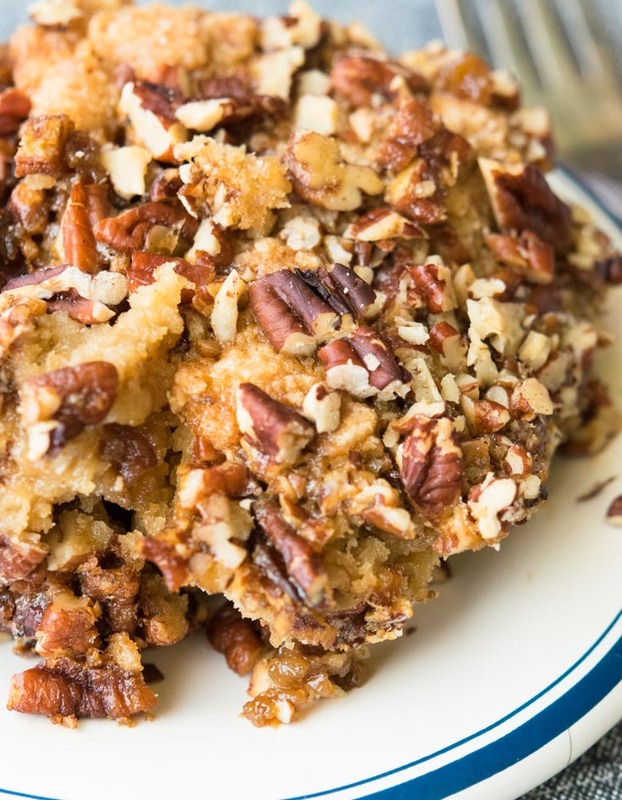 It is very similar to a pecan pie cobbler dump cake, but by making the topping from scratch instead of a cake mix, I’ve found, possibly, an even better balance of sweetness and texture! The topping is a lot cake-ier and not quite as crunchy. I’m telling you- this one is over the top ah-mazing!! This popular variation of Dixie’s Pecan Pie Cobbler is actually a double-decker pecan pie with two pie crusts. While making Pecan Pie Cobbler with pie crust is one way to go about it, I love the sublime cake-like cobbler topping in our recipe. Leave the pie crusts in the freezer and bring on the cobbler! 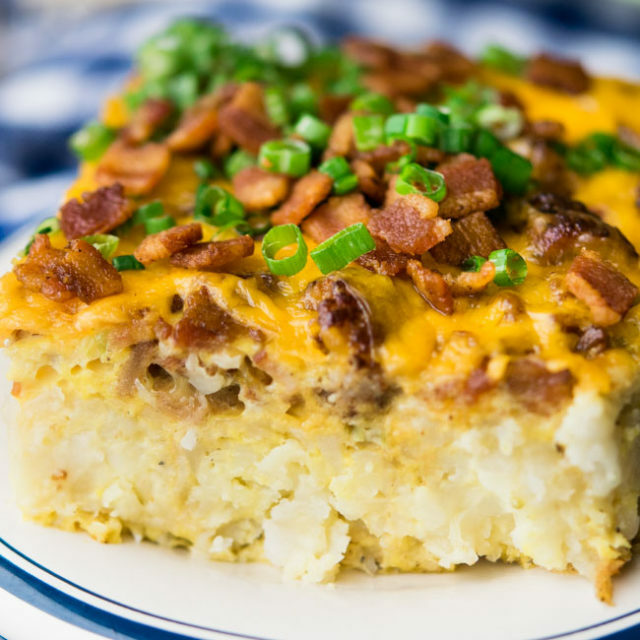 This recipe makes a full 9×13 pan, so it’s perfect for family get-togethers or potlucks- just don’t expect to bring home any leftovers! What Is Pecan Pie Cobbler? Close your eyes and imagine that your grandma’s pecan pie married your favorite cobbler. Yep- that’s right. It’s the ooey gooey insides of a pecan pie topped with a perfectly sweetened cakey cobbler topping. 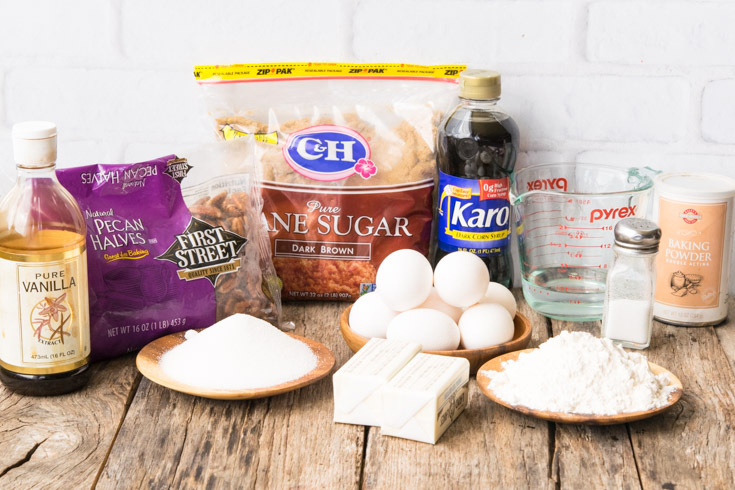 What Ingredients Do You Need To Make Pecan Pie Cobbler? 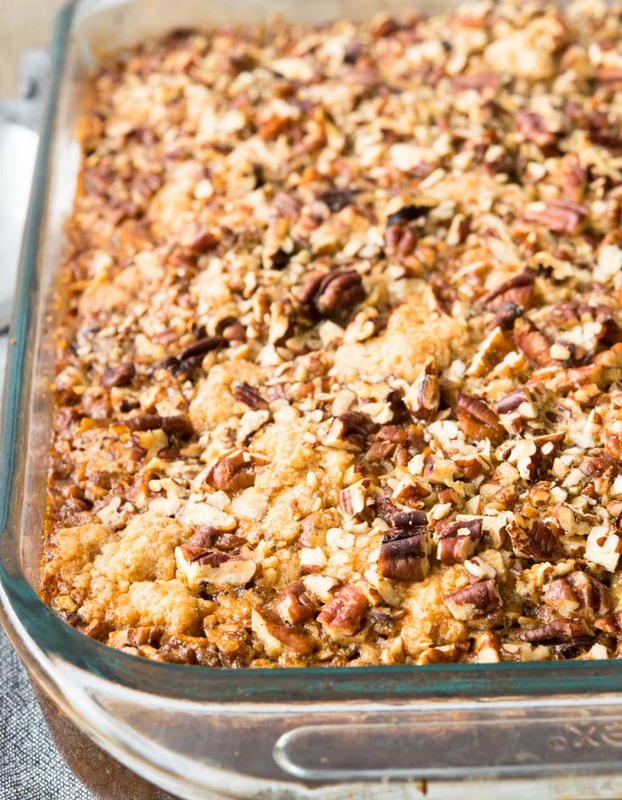 To make my Pecan Cobbler recipe, you’ll start off with your traditional pie ingredients- eggs, corn syrup, brown sugar, butter, vanilla, and of course, pecans (which are known as nature’s healthiest nut- sounds like a good excuse to have another slice)! 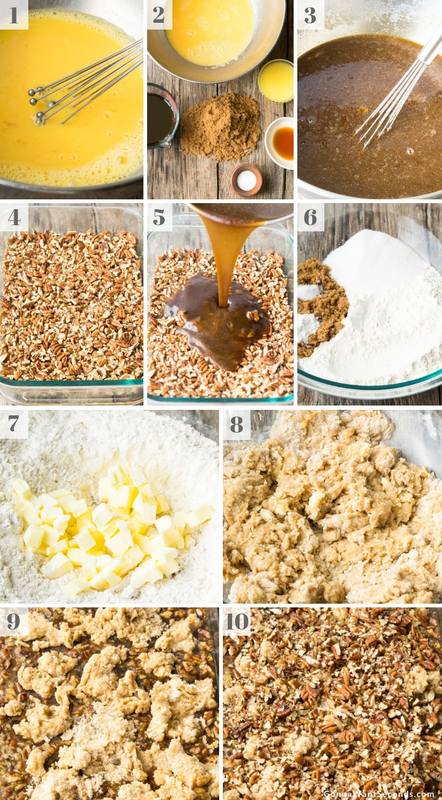 For the topping, you will need flour, sugar (granulated and brown), butter, salt, baking powder, boiling water, and more pecans! 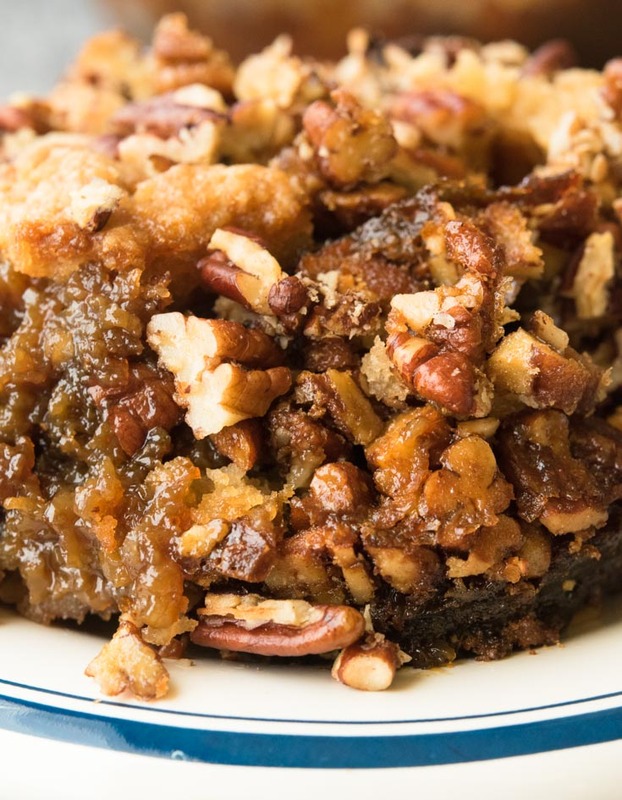 How Do You Make Pecan Pie Cobbler? 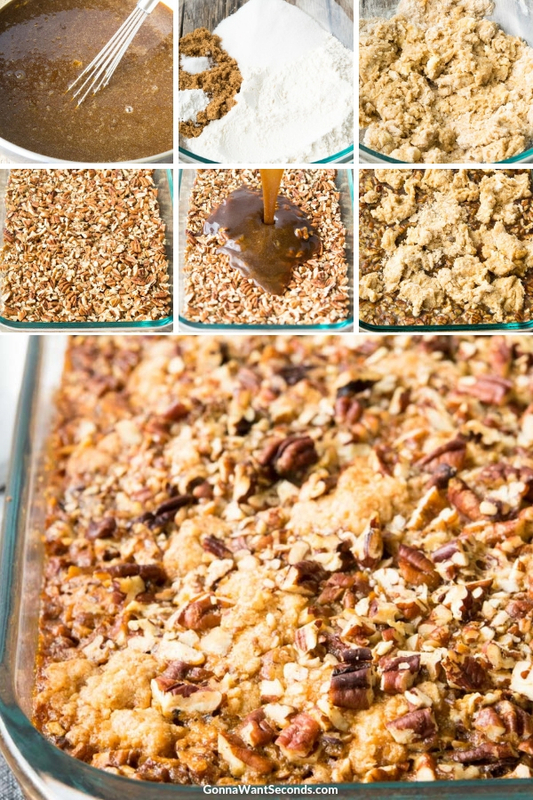 To make Pecan Pie Cobbler, simply combine all the filling ingredients and pour into your prepared pan. 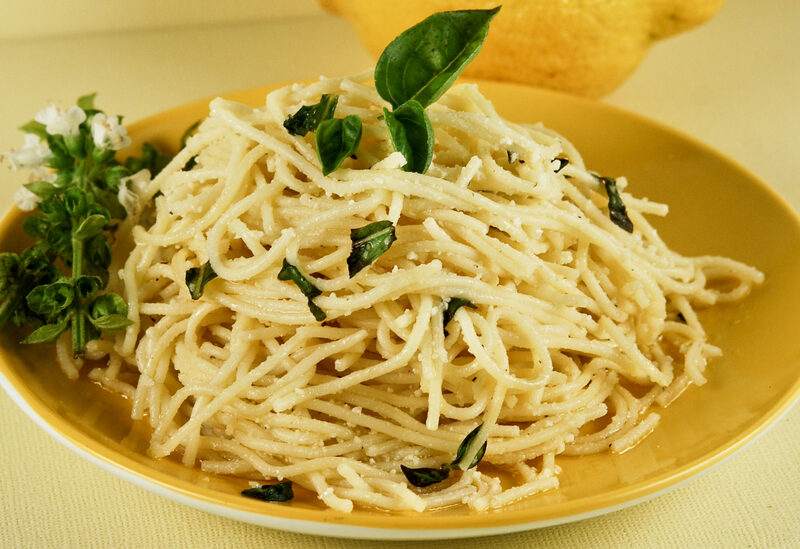 Then, create the topping by cutting the butter into the dry ingredients to form a crumbly mixture. Add the boiling water and mix until it forms a wet dough. Drop spoonfuls over the filling and sprinkle more pecans over the top. Pop it in the oven and bake! 1. Preheat oven to 400 degrees. Spray non-stick cooking spray in a 9×13 baking dish. 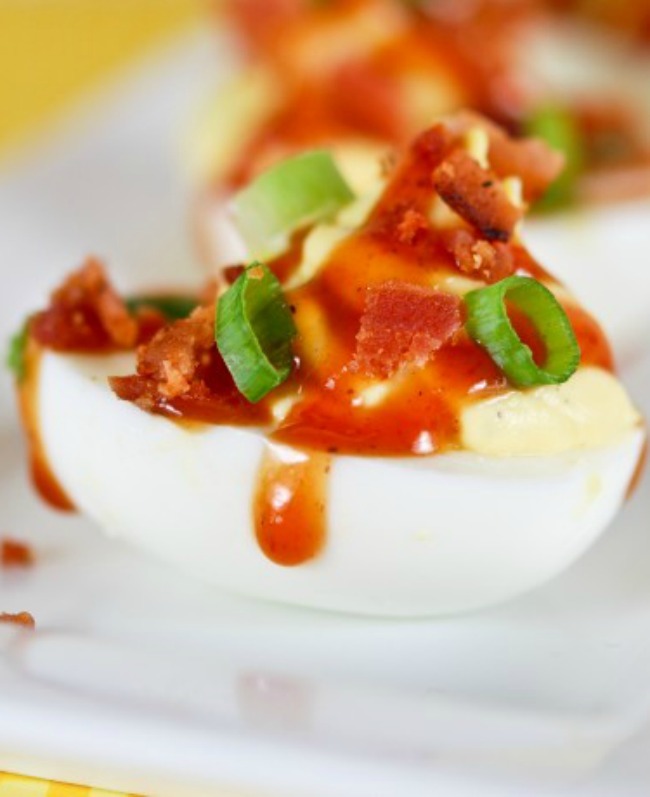 In a bowl, whisk eggs until combined. 2. Add brown sugar, corn syrup, salt, melted butter, and vanilla. 3. Whisk until well combined. 4. Sprinkle 3 cups of chopped pecans into the prepared baking dish. 6. Make the topping: Combine the first 5 ingredients in a mixing bowl. 7. Add small pieces of butter into the mixture using a pastry blender or 2 butter knives. 8. 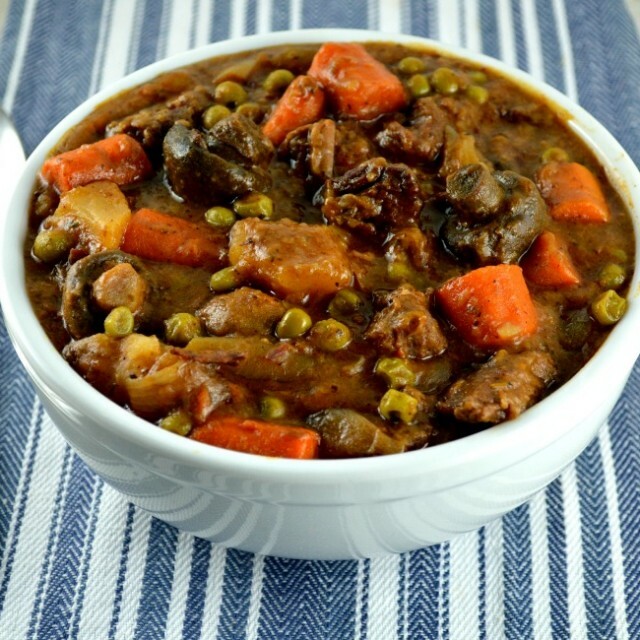 Mix until the mixture resembles coarse meal. Pour in boiling water. Stir until mix through. 9. Drop large spoonfuls of dough over pecan mixture. Sprinkle the remaining 1 1/2 cups of pecans. 10. Bake in preheated oven for 10 minutes, then reduce heat to 325 degrees. Continue baking until filling is firm in the center, and a knife inserted into the center comes out clean, about 25-35 minutes. Looking for more Pecan Pie Variations? You can never go wrong with Classic Pecan Pie, but why stop there? Our Pecan Pie Bars include everyone’s favorite pecan pie filling over the top of a thick, buttery cookie base. Perfect when you need a more portable version of pecan pie. They pull together easily and voilà- pecan pie heaven in a snack that you can hold in your hand! 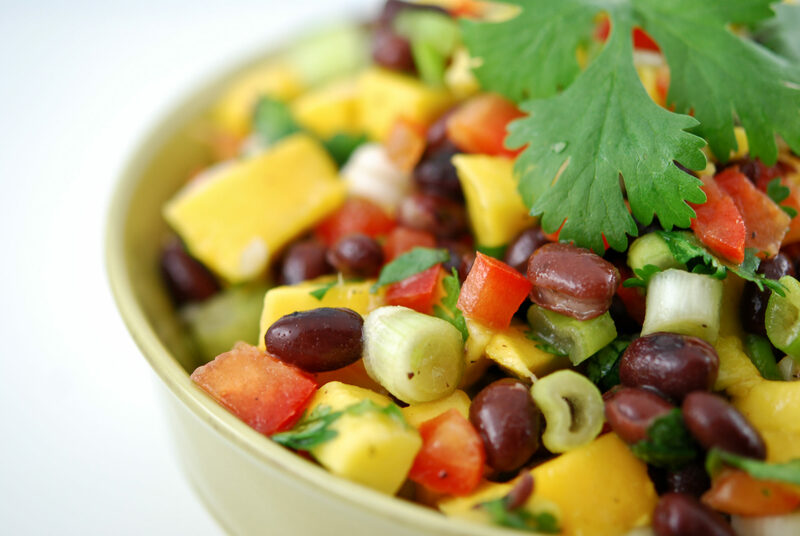 Think picnics, potlucks, summer barbecues! If you’re looking for an alternative to pie- check out our Easy Bourbon Pecan Pound Cake with Caramel Glaze. Buttery, rich, and decadent, this pound cake is simply bursting with pecans, and the caramel glaze takes it to a whole new level! Don’t forget to try our nutty and buttery, crunchy and chewy Butter Pecan Cookies ! In a medium mixing bowl, whisk eggs until they're well combined. Add brown sugar, corn syrup, salt, melted butter, and vanilla and whisk until evenly incorporated. Sprinkle 3 cups of chopped pecans into prepared baking dish then add egg mixture. Meanwhile, make the topping; In a medium mixing bowl combine the first 5 ingredients. Use a pastry blender or 2 butter knives to cut the butter into the dry ingredients, until the mixture resembles coarse meal. Pour in the boiling water and just stir until the mixture comes together and is mixed through. Drop large spoonfuls of dough over pecan mixture. Sprinkle with remaining 1 1/2 cups pecans. Place the baking dish on a rimmed baking sheet, and bake in preheated oven for 10 minutes, then reduce the heat to 325 degrees and continue baking until the filling is firm in the center, and a knife inserted into the center comes out clean. About another 25-35 minutes. Boiling Water– It is important that your water is actually brought to boiling. I’ll spare you the science, but boiling water achieves gelatinization of the flour, which gives your cobbler topping the perfect texture! Cold or even warm water won’t produce the same results. Spice it up- While not typically included in traditional pecan pie, I think a bit of cinnamon compliments pecans beautifully. 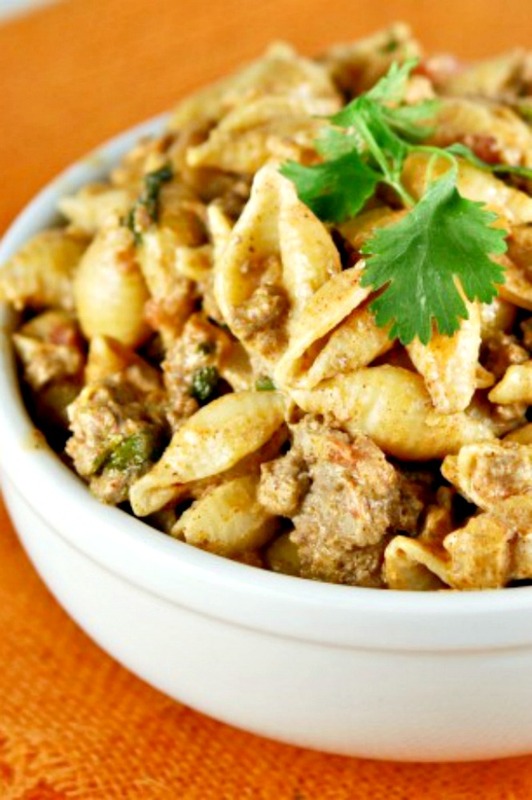 Consider adding a teaspoon or so to the topping for a spicy twist! 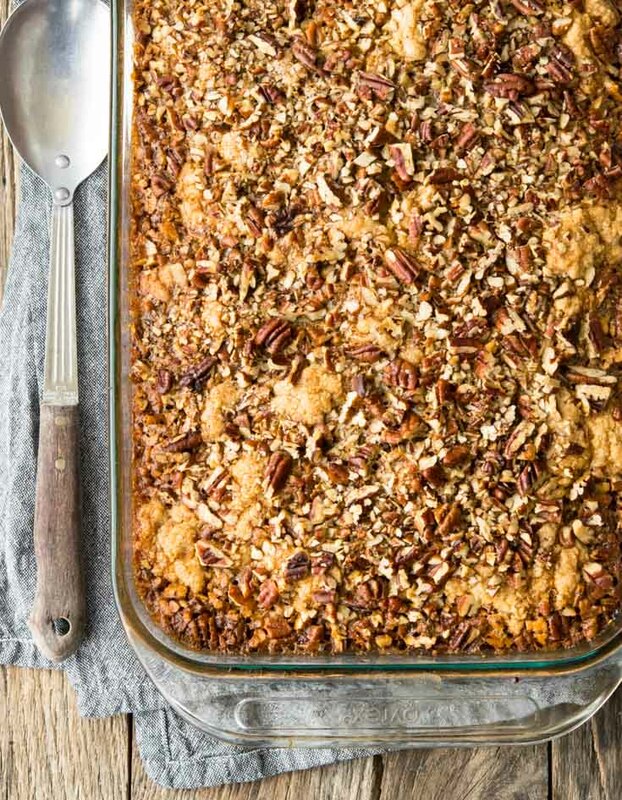 Can You Make Pecan Pie Cobbler Ahead Of Time? You can make this a day or so ahead and store tightly wrapped. Freezing might alter the consistency slightly, but it will keep well for a couple of months in the freezer. Just be sure to cover it with a couple of layers of cling wrap and a layer of foil on top for added protection. What’s The Difference Between Cobbler and Pie? A pie has a crust bottom that is filled with a variety of different things and sometimes has a topping like crust, meringue, or crumble. A cobbler does not have a bottom crust and the filling is covered with a cake-like topping. 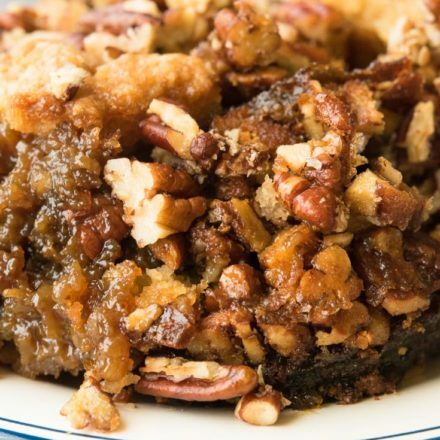 With our Pecan Pie Cobbler, we bring the best part of a pecan pie- the filling- into a delicious, easy-to-make cobbler that feeds a crowd. 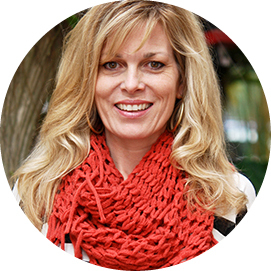 It’s a great twist on Plain Jane pecan pie! Honestly, you might have dreams about this one!!!!! I made this for Christmas dinner and served it with a drizzle of homemade warm caramel sauce. The family loved it! Hi, Craig! Thanks for your feedback! Glad your family loved it! This looks amazing! Can’t wait to dig into this! So, thoughts about halving the recipe? We’re a small family and I’d hate to make them waste my efforts. It looks super yummy especially since the filling is my favorite part of pecan pie.